Protect telecom equipment from harsh weather more cost-effectively with shipping container shelters and switch rooms. Shipping containers offer piece of mind and easy access for technicians by shielding key equipment like UPSs, generators, battery arrays, and cabling behind corten steel. Weather-tight seals to keep out rain and snow. Custom utility ports for back hauls and power connections. 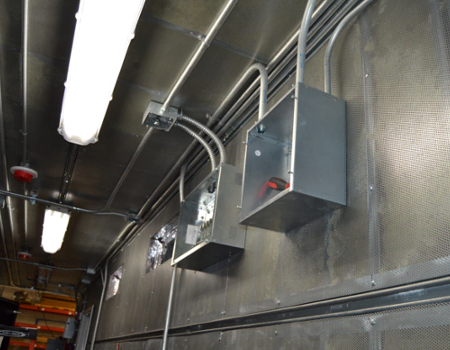 Installation for heavy-duty HVAC systems. Unistrut on interior walls for easy rack and cable tray installation. As long as the ground is flat, dry and level, shipping container shelters can be placed directly at the cell site without a foundation. Placing the shelter on stilts? The corner castings can attach directly to the pillars with easy twist-lock connections. Don’t worry about installing valuable equipment at cell sites while it’s raining or snowing. Falcon Structures can ship containerized shelters directly to the OEM’s facilities for controlled installation and testing. Our quality-controlled design process also ensures that we can create replicate equipment shelters. OEM customers often choose to keep spare shipping container enclosures at their facility on stand by for speedy replacement. 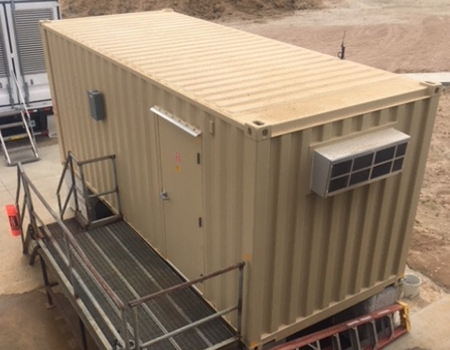 Whether you need a 10-foot shelter for cell tower enclosure or two merged 40-foot containers to create a switch room, Falcon’s design team will work with you to create a solution. Don’t just believe us, check out testimonials from our OEM customers. Have a custom enclosure in mind? We're happy to answer your questions. Contact us at 877-704-0177 or sales@falconstructures.com.